Never Not Knitting... The Yarn Shop! Enter to win the secret November Tea Time Club Spot from Augustbird by leaving a comment below with your contact information by October 15th. Only one comment per person please. The winner will be announced in Episode 92! That looks like a really fun club! I'd love to win! Sounds like the club for me! Thanks for the chance! I love yarn! I love tea! What an interesting club! I'd love to give it a try. This would be such a fun club! thank you! Sounds like a great club. Thanks for th giveaway opportunity. I'd love to win this club spot for November. Such a great combination of tea, yarn and pattern! What an interesting podcast. I'd love to win the club spot. 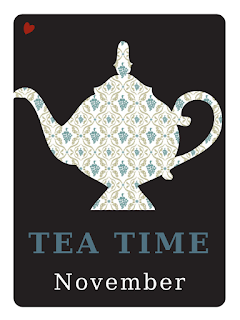 I've already got a spot in November's TeaTime & am very eagerly awaiting your pattern & how it inspires Augustbird ;) I would like to enter to gift a spot to my knitting mentor who loves tea & your designs. I listened to your podcast for the first time today, and really enjoyed it! I was also fascinated by your guest. I have subscribed to your podcast. Please include my name in the gift drawing. I love your blog and podcast and would love to enter to win the tea. I'm looking forward to visiting your new boutique, it looks super cute! Great giveaway opportunity! I don't drink tea but I use it in my moisturizing lotions! Your new shop is adorable! Thanks for the opportunity to win the club package. I just found your podcast and love listening to all the stories. Tea and knitting- what could he better? Knitting and drinking tea, its like she looked inside my heart for this! This club looks amazing and I'm so happy to start listening to your podcasts again- another great thing to love about the fall!! Delicious! Thank you for the chance to win such a fantastic prize! I'm not fond of mystery shawl KALs. I do sign up in advance but then usually look at all of the spoiler photos before deciding if I want to knit the project...I'd definitely have your boutique on my list of destinations if I were to travel to your area. 45 degrees this morning in Wisconsin! Who wouldn't love some tea and knitting? Thank you for this opportunity. So good to hear you - welcome back! Congratulations! I'd love to win 😊 . Tea is my beverage of choice also. I was recently on a trip to Ireland and really enjoyed the tea there! Of corse I traveled with my knitting! Tea and knitting...the best things! What a great combination, thank you for the opportunity! So nice to hear your voice again! It's been a very long time! Thanks for all the wonderful things you do! Love your little shop. The yarns are wonderful to knit with. Sweet people too! I stumbled across your podcast by accident just last night! What a lucky find. Please enter me for the drawing from Augustbird. It was great to hear your latest news. Congrats on your boutique yarn shop. Your career is taking off in amazing ways! Thank you for sharing about Augustbird on the podcast. I'm sewrunknit on ravelry. Nice to have you back!! Lots of fun stuff!! Good Luck with your shop! Enjoy!! There is not much I enjoy more than a good cup of tea and knitting. Throw in a good book and i'm one happy girl. Oh I love tea, and your patterns!!!!! Tea and yarn, yarn and tea. How can that get any better? All three of my favourite things! Tea is my fuel! Would love to win this, what a lovely giveaway. Thank you, Alana! What a wonderful giveaway. Tea and yarn, perfect companions. Congratulations and best of luck with your shop. Just found your podcast. I arrived just in time as I love knitting and tea. I didn't even know there were knitting clubs. I would love to win this. Thank you for the opportunity. I love tea and I love yarn... I would surely enjoy the club. I love tea and yarn. I think I may be in trouble! Wow!! You always have such amazing giveaways, Alana ♥ CrochetLover103 on Ravelry. I would love to try yarn from Down Under! It was great listening to you again today in my car on my way to work! Glad you're back! Double excitement for me yesterday... a new NNK episode and featuring a fellow Aussie! I would love a chance to win. So nice to hear you again! Thank you for your patterns, your podcast, and for the opportunity to win this! Hopefully someday I can visit your shop. Although I have never done a Mystery Knitalong before, if it is an Alana Dakos pattern, I'm in! Also, I love tea and yarn, so it would be wonderful to win the drawing. Thank you! The giveaway looks awesome. Thank you for the opportunity. I would definitely consider a Mystery Knitalong from you Alana. I have never done one before but I love all your designs. It was lovely to hear a fellow Australian on the podcast. What a lovely company! I'm chrissaah on Ravelry, and would love to win! Oh my! It was my first time listening to your podcast and when I heard about the Tea Time club, I nearly drove off the road trying to set a reminder to comment when I got to work! I love tea, I love yarn and I love knitting. Interesting podcast! I would love to win. Rrochelle on ravelry. Wow - an Alana Dakos pattern, yarn and tea? Yes please! I enjoyed hearing you again. Congrats on the boutique. I wish I were in that area to visit. The Tea Time Club sounds lovely. I'd love to win a spot. I am jamiewalcott on Rav. Glad you're back! I would love to do a mystery knit-a-long to one of your shawl patterns! I've never done one before but have always wanted to. Also I would love to get the November tea and yarn subscription! Oh, that sounds like the perfect club, what could be better than yarn and tea?! Wool and tea go hand in hand. Thank you for the opportunity. The club sounds fabulous!!! I LOVE tea & 0f course it always goes with knitting! So excited for the new podcast season- I'm hooked! So glad you're back. Tea and yarn sounds like a great combo. Welcome back! I would love to stop by your cute knitting boutique. Will do so the next time I'm down that way. That club sounds fun. My ravid is craftyland. What a lovely prize, I love the comforts of tea and knitting - and November is my birth month! I would love to experience this intriguing club idea. I am terriglo on ravelry and cinabarmom@aol.com by email. I would be in for a MKAL. I can't resist them. I love tea and I love yarn! Winning both at the same time would be awesome! Oh, please!! My favorite things all in one! Thanks for another great show, and for the opportunity to win - this looks like an awesome club! So nice to hear that you're back podcasting! I'd love to be a part of Tea time November and I think I might be interested in a mKAL as well. Spinnkrok on Ravelry. Really hoping I'm not double posting. I enjoyed your new podcast and for the contest! So glad you are back. I just love your show. So happy to be listening to your podcast again! Would love to be entered to win this give-away! Tesamary on Revelry or email - birdnerd1@hotmail.com. Thank you! I am very glad Never Not Knitting is back for another podcast season! Welcome back! The yarn/ tea/ pattern gift combo sounds too marvelous for words... I am Fatmouse on Ravelry. Happy to have your podcast back for another season :) The Tea Time Club sounds so fun! Thanks for the change to win. Love the podcast! I'm catching up on old episodes. My ravelry name is booksandhorses123 and my email is orule07@gmail.com. I love to sip tea while knitting! My Rav id is dmess. So glad you're back, Alana! I think the MKAL idea is great. I've never done one before, mainly because the timing hasn't worked out for me. With advance notice, I would love to participate in your MKAL, as I am such a fan of your designs. The tea/yarn club sounds great too. Thanks for the chance to win! Sure missed you! I am definitely interested in a mystery KAL, they are always fun. My sister lived in Australia for 3 years so I am always interested in happenings "down under." Tea, yarn and a pattern: a recipe that can't be beat. So nice to find an episode of your podcast to download! And your store front is just lovely! Best of luck to you! I'm glad to see you are back to podcasting! I would be interested in joining your mystery KAL if you decide to go forward with it -what a fun idea! I have just listened to your Pod Cast for the first time - It was great! You mentioned a mystery knitalong and a shawl you are designing that sounds simply wonderful. I am doing two MKAL's at the moment and I'm really enjoying them. I would be interested!!! So glad you are back! I loved the episode and I love all your designs so I would not hesitate to participate in a mystery knitalong if you decide to have one! And, who wouldn't want to win tea and yarn! Wow--talk about a few of my favorite things! The yarn looks lovely, the tea sounds fun, and a new knitting pattern is always exciting! I'm Dragonbard on Ravelry. Great podcast! The yarn is new to me so it would be a treat, love trying new to me teas & your patterns are wonderful. Love knitting clubs! Love hearing about your new venture on the podcast. Glad you're back - along with the rest of the fans! Would love the Nov Tea Club prize! Yayyy! Your podcast is back, Alana! The November Tea Time club looks wonderful!! So glad you are back on the air. ANd as always a fun give away. I'd love to try this Australian wool. Your new shop sounds like a perfect place. Glad you are back, although I'm still catching up from the beginning. I really enjoy listening and would love this beautiful give away! I'm Talvi on Rav as well. Glad to hear you had a great summer! Thank you for having a giveaway right from the start!! Hope to visit your boutique someday, sounds lovely. I would absolutely LOVE to win the Augustbird prize. I'm spinknitluv on Ravelry. I stopped by your shop during the yarn crawl and bought some quince & co. I just loved your shop, so inviting. Another great episode and I would absolutely love to to win this giveaway! I'm thishandmadelife on rav & instagram. I would love to participate in a worsted shawl KAL! It sounds fun and it is totally a piece missing from my wardrobe. I'll keep watching for updates on that and congrats on the shop! Wow! What a wonderful club! I can't wait to stop by your shop on the way down to LA. I am MoxyKnitter on Rav. So much of Rebecca's story really resonated with me as a new mom. My daughter will be 6 months old next week and I'm hard pressed to find knitting time, but really enjoying all the wonderful special moments with her. Love the kit! Thanks for the chance to win. Lovely giveaway! hscruggs on ravelry. This kit would be so much fun! So wonderful to listen to your podcast again now we are back in fall! Tea, yarn and a pattern? Does it get any better‽ ;) Thanks for the opportunity! All my favorites too! Curling up with a cuppa, and new yarn, mmmmmm glorious. OOOh! Tea and yarn! That's awesome!! Thank you so much for your generosity and the opportunity! Tea and knitting, doesn't get much better than that! I love tea (all kinds) almost as much as I love sticks and string (all kinds). And best wishes, Alana, with the new brick and mortar store! I'm a big tea drinker, would love to win. Wow! This club sounds fantastic. Your shop looks amazing! Thank you for the opportunity to win such a wonderful prize. I love tea and yarn...especially together!! I am both a tea lover and a lover of your fantastic patterns, so I would definitely love to win the terrific giveaway you have offered. What a wonderful yarn club! Nothing sounds more fun than a cup of tea with one's knitting. 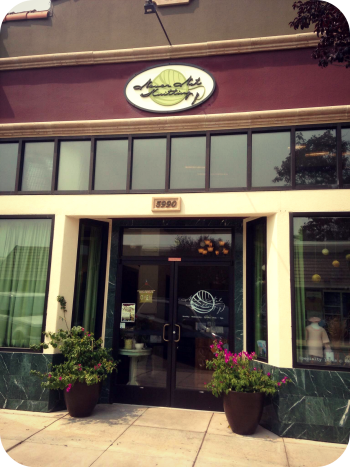 Your little yarn boutique looks like a lovely spot to visit. Congratulations! Please throw my name in the hat for the drawing. I can relate that knitting is my social security blanket. I much prefer to sit on the edge of the group, knit, and listen. Polly put the kettle on! I'd love to stop by your new shop to have a cup of tea and knit. Congratulations! Finally new episodes. Love your podcast. And would love to visit your shop... sadly it is a bit far from the Northern parts of Norway. Thank you for very interesting episode! Congratulations for the shop, this is a lovely place! And also for introducing the Tea club and the August bird store! The yarns are beautiful! Welcome back! Tea and yarn - what a perfect combination. Most days, I'd rather have tea than coffee so I drink a pretty fair amount of tea. Thank you for sharing so many artisan yarn lines. I live in a pretty rural area (no yarn shops) so I look forward to hearing about yarns I would probably never hear about otherwise. Welcome back! I do tea parties with my little girl who really inspires my knitting projects. I am so excited by this club! So happy the podcast is back! Tea and knitting sounds lovely for fall.